Do you like Pirates! The Match-3? Share it with your friends. Pirates! The Match-3 is a very addictive logic game in which you have prepared a large portion of various levels of difficulty divided into two game locations. In each round, your task will be to help the pirates get their valuable prey in treasure. 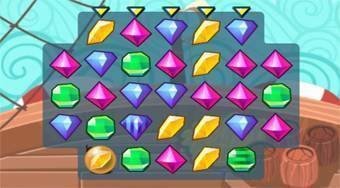 Connect three of the same gems and try to upload the desired number of points before the time runs out.